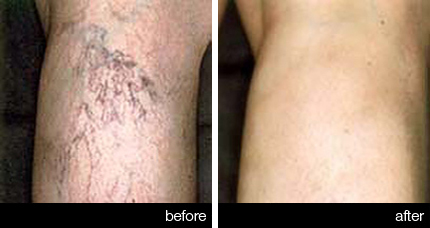 Unsightly veins on legs can cause considerable embarrassment. Today, removal of spider veins or varicose veins is a relatively easy process and can be done without surgery or considerable downtime. Generally speaking, veins are given two names. Smaller veins are commonly referred to as spider veins or capillaries – even on the face or the legs; while larger veins are commonly referred to as varicose veins. The removal procedure of veins involves injecting a solution directly into a vein. The solution causes a reaction in the capillaries or veins, causing them to collapse. The blood is then forced to move through healthier veins instead. The newly collapsed vessels are slowly absorbed by the body and simply fade away from view. Occasionally the same vein may need to be injected more than once, however, sclerotherapy is usually a highly effective procedure if performed correctly, with minimal treatments required. The good news is that sclerotherapy is relatively painless and requires absolutely no anaesthesia. It is performed quickly and easily in Dr Feldman’s treatment rooms. Does Sclerotherapy have any side-effects? After the procedure, there may be a small amount of swelling, skin-colour changes and possibly minor itching around the treated area, although this is short-lived. There are no other side-effects to report. What happens after sclerotherapy treatment? After you’ve had the treatment, you’re treated veins will start to fade over the next few weeks. Full results are seen in as little as one month. Occasionally, several sclerotherapy treatments may be needed. This is determined by the severity of your condition and the approximation of treatment is needed is best discussed in your first consultation with Dr Feldman. Sclerotherapy treatment is a straightforward “walk-in – walk out” lunchtime procedure. There’s no downtime, and walking is encouraged. Many patients who have had facial sclerotherapy are amazed at how simple the procedure was and the profound difference it makes to their overall appearance. As every part of our faces so noticeable, even small improvements can make a marked difference to one’s appearance. Sclerotherapy is often performed on legs, however, many people choose sclerotherapy on their face or other parts of the body – with great success. What causes spider veins on the face? Spider veins (and also varicose veins) are mostly hereditary. Hormonal influences such as pregnancy can also be a contributing factor. Many lifestyle activities can also contribute to or exacerbate spider veins, such as sun damage, alcohol, smoking or drug use. In particular, these spider veins are evident around cheeks, the nose and eyes, all of which respond well to facial sclerotherapy. How much will I improve after treatment? Statistically, 70% improvement is shown after facial sclerotherapy, but improvements of up to 90% or even higher have been shown. What is the substance used in facial sclerotherapy? The same substance that is used in leg sclerotherapy is used in facial sclerotherapy but in a much lower concentration. As with all types of sclerotherapy, the risks are extremely low and the side-effects are minor and short-lived. Usually there is nothing more than a touch of redness or swelling, which can be easily alleviated by applying ice packs to the area. As the solution injected in facial sclerotherapy is weaker than the solution used for legs, several treatments may be required. Dr Feldman suggests that appointments are spaced approximately one month apart.